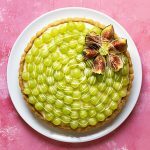 This sweet wine and grape tart with a silky, aromatic custard filling and a very easy olive oil crust is one of the best summer desserts you’re going to make. Make the pastry cream: Transfer the sugar, the cornstarch, the salt, and the cinnamon to a pot and stir well to combine (don’t turn on the heat yet). Add the eggs and whisk until everything is smooth. Add the vanilla, the milk, and the wine and turn on the heat to medium. Whisk constantly until the mixture thickens (it may foam while you whisk it, but the foam will disappear as the cream thickens). When you see the first bubbles and the cream has thickened, turn off the heat and transfer the cream to a heatproof container. Add the cold butter and stir until melted and absorbed. Cover the cream with cling film, making sure that the film touches the surface of the cream, and let it cool completely. Make the olive oil crust: Transfer the sugar, the cinnamon, the zest, and the salt to a bowl and stir to combine. Add the olive oil and whisk until the sugar is almost melted. Add the egg and whisk until creamy. In another bowl mix the flour with the baking powder and then add it to the olive oil mixture. Mix until the dough just comes together (don’t over mix) and refrigerate for 20 minutes. Preheat your oven to 320°F (160°C) (a fan-forced oven will have better results). Cut pieces of the dough and lay them onto the tart pan. You’ll need approximately two-thirds of the dough for the 9-inch pan. With the bottom of a measuring cup, press the dough onto the tart pan in order to form the crust, and cover the bottom and the sides of the pan. Make cookies with the rest of the dough. Prick the crust with a fork and bake for 45-50 minutes, or until golden brown. Let it cool completely. Make the tart: Stir the cream well with a spatula to loosen it up and fill the crust. Level the surface, top with fresh fruit, and drizzle with the melted chocolate. If you want to use only grapes, cut them in half, otherwise, they may be too heavy. Refrigerate for at least 4 hours for the filling to set. If you don’t want to use the sweet wine, replace it with whole milk and add 1 more tablespoon of sugar and 1 more teaspoon of vanilla extract. If you want to use only egg yolks for the filling, replace the 2 eggs with 5 yolks.